Carrying on the chocolate espresso theme from last Friday, I thought I’d share another amazingly delicious breakfast recipe with you today – imagine combining a rich, dark espresso with a light and velvety slice of cheesecake, all smothered with a layer of delicious dark chocolate. That’s what this baked oatmeal is all about. Oatmeal’s a fairly dull and boring breakfast on it’s own, right? I have to ask you guys because I’ve never actually eaten plain oatmeal – the closest I’ve ever gotten is oatmeal mixed with sugar and cocoa powder. That’s almost plain. Now I’m not saying this is the sort of breakfast you should eat every day – it doesn’t take two minutes to whip up like this healthy deep dish breakfast cookie – but it does make a wonderful weekend breakfast treat. And what better way of enjoying a relatively healthy and filling breakfast than essentially baking a massive oatmeal cookie and stuffing it with chocolate and cheesecake? This recipe uses a special variation of Ritter Sport chocolate which has an espresso layer. Have you ever tried it before? It’s so good that I nearly devoured the whole bar before it made it’s way into the recipe. And by nearly, I mean totally did and had to rush out to the shops before breakfast to buy another bar. We’ve all done that before….right? If you’ve got a touch of the Monday blues, I can guarantee that this dark chocolate espresso cheesecake baked oatmeal is sure to turn those blues into sparkly rainbows after your first bite. Preheat the oven to 375F/180C and line a 9x9-inch baking dish with parchment paper. 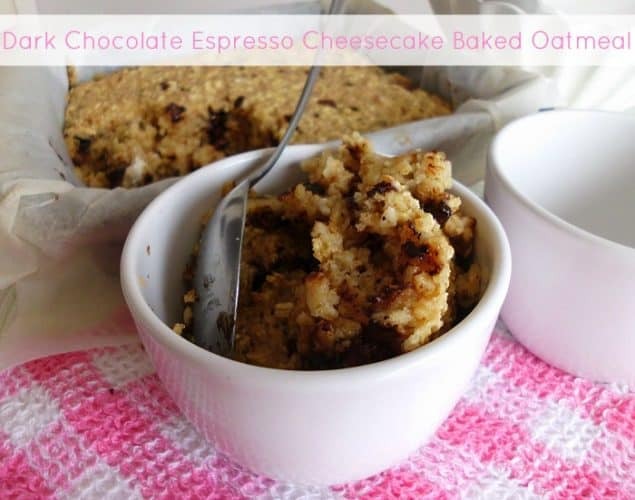 Stir together the oats, sugar, baking powder, salt and chocolate (and instant coffee if using). In another bowl whisk together the milk, egg, and vanilla extract. Pour the wet ingredients to the dry ones and stir until combined. Stir in the cream cheese. Break it apart with a spoon whilst still leaving in a few chunks in there. Pour into the baking dish and bake for 23-25 minutes, or until just set - serve immediately. you had me at dark chocolate espresso. I like how you dressed up the oatmeal. who wouldn’t eat this? This looks AMAZING! I eat oatmeal pretty regularly and I am always looking for a way to jazz it up! Holy cow…this looks so good Nicky! I’m glad you used ZipList. It makes it so much easier for me to keep track of recipes I want to try… and I can’t wait to try this. Do you know where I can find the espresso chocolate? Is it hard to find? WOW! What a flavor combination. I want some!! Wow this is my kind of breakfast:) We love oatmeal at our house. I can’t wait to try this soon!